My new book GETTING HIGH is out now and, I’m thrilled to say, getting some rave reviews. You can purchase it from your local bookstore, or online in the US here, or the UK here. It’s a book that’s been a long time in gestation. I actually finished a full draft a year ago. I’d also written and presented a 30 minute meditation on flight for BBC Radio 4, and in the course of that a literary agent had got in touch to say how much she’d enjoyed it. When I told her it was based on a book that I was writing she jumped at the chance to read it, and really loved it. But… Quite astutely, her comment was that there was a story under the surface that was not being told. She said I could go ahead and publish the book as it was, but her advice was to dig further. She was right, damn it. In fact, just a few days later I received through the post some diaries that had been written by my sister when she was just 10 years old. Reading them didn’t just uncover this narrative I’d half-buried, it blew it wide open. As I explain in the book, I’d never quite understood why it was that I’d been drawn to write about flight. Now I knew. I had no choice: I had to go back to the beginning, back to the trauma that had push me – and the rest of my family – to take flight ever since. 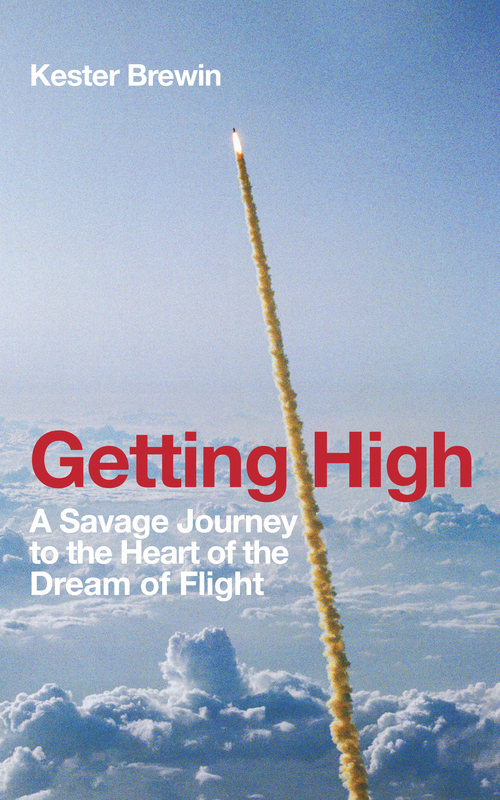 Borrowing from Hunter S Thompson’s subtitle for Fear and Loathing, GETTING HIGH is ‘a savage journey to the heart of the dream of flight.’ It’s a journey with 3 main layers. On the surface, this is a history of the extraordinary period in the latter part of the 1960s when we took off in the most remarkable ways. All at the same time there were major advances in technologies of space-flight and chemical-induced highs. But not only did the LSD counterculture and the Apollo missions to the Moon coincide, there were also massive changes in religious and social experiences too. Drawing on a Day-Glo cast of Hells Angels, hippies, Swiss chemists, astronauts, dreamers and preachers, all set to a soundtrack of a suddenly-turned-on Beatles, GETTING HIGH sets out to explain why it was that so many in the West were so desperate to lift away. Underneath all this short history of a particular decade, there is also a much longer view, right back to our most ancient past. What did it mean for us – clearly the most intelligent creatures on this planet – to not be able to fly? We could do so much, and this one thing that we couldn’t do we imbued with great meaning. We looked to the above. We told ourselves a story that we had fallen. We ached to return to be reunited with the Most High. GETTING HIGH looks back to Plato, to Simon Magus and Ibn Tufail, to the Renaissance and the great theological battle over altitude – building to the extraordinary moment when Etienne Montgolfier rose up above pre-revolutionary Paris. Now that someone had risen to the above, not only were we desperate to know what they had seen, but we were desperate to penetrate further and further, up towards the ancient lights that we had for so many thousands of years lain back and dreamed of. The desire to get high is a deep one. We are all born flightless, the book begins, every one. Despite great longing, despite the fact that the majority—me included—would choose flight as our superpower, after so many thousands of years each of us still drops into the world smooth-skinned and featherless. From that moment on the ground suckles us to itself. Gravity calcifies in our bones and we do not like it, so our fathers make us laugh by swinging us into the air. When we grow heavy they let us down and we turn instead to gods to lift us, only later understanding that if we are going to be able to fly we will have to forge our wings for ourselves. And so, at its foundation, GETTING HIGH is really a memoir. It is a deeply personal reflection on a family trauma that sent me flying. As such, it’s a book that I’ve had to spend time talking through with those close to me, and my sister in particular. I’m massively grateful to her for letting me write it, and for the support that she and my brother have shown as I’ve sought to go back and examine the different ways that each of us took flight, and the reasons stretching even further back that forced us to do so. I’ve written and read a great deal about the ‘radical theology’ movement, but what I’ve more recently felt was missing was any sense of genuine personal narrative within that. How did people end up here? GETTING HIGH is my own answer to that question. This is a book about ecstasy and flight to the above but, of course, what it is really about is the opposite. I hope that in the ways that it is candid about the deep seam of depression that has run through charismatic Christianity and late-Capitalist societies it will open up even further the necessary conversations that we need to have about the mental struggles so many of us face. Finally, underpinning all of this, this is a book about technology, about the tools we forge to lift ourselves. Religion. AI. Memory. Drugs. Rockets… and yes, books too. This is an ambitious project, one I have spent a long time crafting. Those who’ve read it have kindly said that it’s the best thing I’ve written. I can’t comment on that, but I do know that it’s the precise book that I needed write at this point in my life. Having urged me to go back and uncover that hidden story, the agent subsequently passed on the book. She’d wanted it to go in a more commercial direction. Others I sent it to were similarly enthusiastic, but wanted to pull it into spaces they were more used to selling: more history, one said, while others asked for more memoir, or more theology, or less. In the end, on a project like this, one has the write the book that one truly believes in. Screw the potential sales. I refused to shape-shift the manuscript because I knew that this was what I needed to do. So, published and be damned, they say. Having helped found and lead Vaux for years, I decided to resurrect it as a small independent publisher. And so here we are, GETTING HIGH its first publication. I’m really, really excited to get this into people’s hands. Mid-April, all being well. In all formats. Thanks for your support in getting this far. I hope you’ll find it as much of a blast to read as it’s been to write. Why can’t I seem to find a place to pre-order this book? BTW, I just finished Mutiny! – the last 10 pages or so I had to read over and over. The whole book was enjoyable, but those last few pages really delivered the closing in a very strong manner, I thought. No pre-order links just yet – these will be up shortly. Glad you enjoyed Mutiny! Glad I’ve finally found soenthimg I agree with! Ordering the book now. My girlfriend and I plan to read it together. Can’t wait! On the second last page of this book, it was written: “The careful ordering of thoughts and words is not a craft that can forge flawless meaning from life’s raw materials, but it does prevent our past becoming an unchartable, sinking mire”(Getting High, p. 201). In this lyrical, accessibly existential, autobiographical recounting of humanity’s insatiable drive to “get high,” Kester Brewin seamlessly examines various interrelated ideas of flight that largely characterized the 1960s (i.e. LSD, lunar exploration and spiritual enlightenment). The end result is a raw, masterfully penned recounting of the past that is (de)constructively critical of the present and future – helping to reorient our focus from the sky back to the ground where we live.